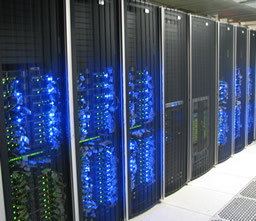 Fram is a High Performance Computing (HPC) Cluster composed of 254 traditional computes nodes. Each has 12 cores and 4 GB of RAM per core. The whole cluster is connected with a low latency, high bandwidth network called InfiniBand. In addition to the traditional compute nodes, it also has 60 GPU based nodes with a total of 180 Nvidia M2090 GPUs. The system is backed with a 720 TB raw Lustre high performance parallel filesystem. This filesystem can perform at around 9 GB/s. The traditional processors have a peak performace of 40 Teraflops and the GPU processors have a peak performance of 110 Teraflops. The Southern California Seismic Network (SCSN), a joint project of Caltech and USGS,monitors real-time seismicity and provides earthquake information products such as rapid notifications, moment tensors, ShakeMap, and ShakeMovie. The SCSN has evolved through the years and now consists about 300 real-time seismic stations. In addition, the SCSN records data from about 100 stations provide by partner networks. The SCSN data are archived and distributed to researchers by the Southern California Earthquake Data Center (SCEDC). 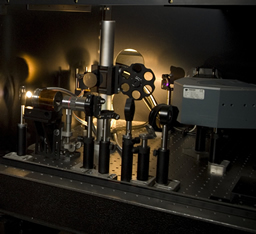 The Diamond-Anvil Cell (DAC) Laboratory allows one to study how planetary materials behave under high pressures and temperatures. 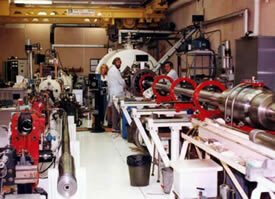 Shock Loading and Impact Facilities are employed for research on impact effects on rocks and minerals and equations of state of minerals. Our portable seismic equipment consists of 15 intermediate band Guralp CMG-40T seismometers equipped with Nanometrics Taurus dataloggers. These are mainly contributing to our research projects in South America and are currently installed as part of the post-earthquake deployment in Chile. Click here for the current deployment map. The Geographic Information System (GIS) Laboratory provides remote sensing, 3D modeling and other geographic information system resources for researchers within the division. The PMA/GPS Instrument Shop is an eight-man machine shop staffed to help design and fabricate mechanical, optical and infrared instrumentation.